This series recounts the adventures of C-3P0 and R2-D2 before they they met Luke Skywalker as they serve various masters over the years. As it turns out, their lives were no less hectic as they became involved in battles versus gangsters, pirates, the Empire and even Boba Fett on one occasion. 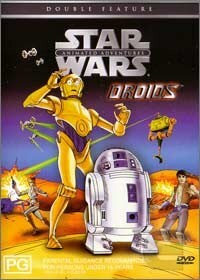 Includes 2 full length adventures: "The Pirates and the Prince" and "Treasure of the Hidden Planet"
After the disastrous Ewok series, Star War Animated Adventures: Droids is a really eyeopener that follows the exploits of C-3PO and R3-D2 before they met Luke Skywalker which is strange because Luke actually made C-3PO. However, ignoring a few inconsistencies, this series is brilliant and features some great cameos by Boba Fett and a plethora of Imperial troops. A perfect DVD for those young at heart or children. Presented in an aspect ratio of 4:3 with Dolby Digital 2.0 Stereo for an "almost" movie experience with the world's most famous robots! Recommended!